BloxLayout, like its namesake BoxLayout, either stacks its components in a column or ranges them in a row. At right is a vertical Blox combining a label, a text area and an inner Blox showing two buttons. Blox exploits varargs to streamline construction code. The code for the example above is shown at the right; it follows line for line the image on the screen. You manage layout options by inserting Blox.Note elements in the varargs lists. To add space between the buttons you add the note shown in bold on the right. 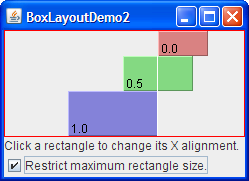 BloxSection delimiters can control how space is distributed between the Components. In the application shown at the right, the blue rectangle is in a "thin" section. Its width is adjusted so the four quarters meet at a point even when the image is replaced with another of a different size. Blox offers a factory to create all four component orientations. The image at the right is generated by calling the same method four times, and each time applying a different component orientation to the result.